Taking a detailed, possession by possession look at how Dante Exum fared versus an absolutely stacked Team USA squad (featuring Marcus Smart, Elfrid Payton, Aaron Gordon and more) in their lone meeting at the FIBA U19 World Championships last July. Note: Exum averaged 25.5 points and 4.8 assists in the next four games after his encounter with Team USA, almost single handedly willing his team to the semi-finals and an eventual fourth place finish. These were essentially the last competitive games Exum played in before his eventual NBA debut next season, and thus a substantial part of his evaluation as a NBA prospect. Leading the 2012 U17 Australian National Team to a silver medal at the FIBA U17 World Championships last summer, which we attended and documented in depth, Dante Exum emerged as the next great prospect to come through the Australian Institute of Sport. Playing exceptionally well in the 2013 Nike Hoop Summit, the East Melbourne native reinforced his impressive NBA upside with his performance in front of the well over 100 NBA scouts who attended the World Select Team's practices throughout the week. A 6'6 guard with 6'9 wingspan who appears to have added some 10 pounds of muscle to his frame since last summer, Exum stood out immediately with his speed, fluidity and ball-handling ability. Accustomed to playing the point guard position at the junior level, the strong play of floor general Dennis Schroder required Exum to adapt playing off the ball this week a challenge he accepted without a second thought in an effort to put his team in the best position to win. A consummate team player who can do a little bit of everything, Exum still managed to be very effective for stretches in practice and score 16 points on game day despite the significant adjustment he had to make. Perhaps the most impressive thing Exum did throughout the week was get to the rim off the dribble. Without the ball in his hands constantly, Exum wasn't able to create as much on the offensive as we saw last summer, but still managed to make his presence felt attacking from the wing. Showing a very low dribble, an exceptional burst and the ability to finish above the rim, Exum is a very smooth finisher, but is not afraid to elevate in a crowd and draw contact either. At this stage, Exum's perimeter shooting remains his most glaring weakness. He shoots the ball from the perimeter with better balance than he did last summer, but his confidence and consistency still leave something to be desired. The next step for Exum as a prospect is becoming a more consistent threat from the outside, something that will give him a legitimate claim to being able to play both guard positions. An adapt passer with speed to burn in the open floor, a great motor and an exceptionally high basketball IQ, the rest of the game comes easy to Exum. He plays with his head up, fills lanes on the break, and rebounds well for a guard. He's a versatile defender with great quickness, improving physical strength, and a team-first mentality. The question for Exum moving forward is where he will hone his craft and what that means to his draft eligibility. Graduating from the AIS this year, Exum would be eligible to enroll at an NCAA program this winter, allowing himself to become eligible for the 2014 NBA Draft after the conclusion of his freshman year. He could also opt to attend prep school for a half season, let his recruiting ramp up, and enroll at a NCAA program for the full 2014-2015 season, making the 2015 NBA Draft the first he could enter. At this point, Exum is unlikely to go pro and declare in 2014 as an international early entry prospect from what he told us. Intent on playing in the NCAA and continue to improve on his weaknesses, the question is when will he enroll and what school will make space for him. 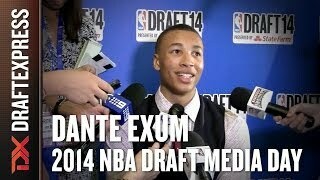 A coachable and extremely talented prospect with elite intangibles and a promising skill set, Exum is a player NBA teams will track closely regardless of where he ends up. That will start this summer when he leads the Australian U19 National team at the World Championship in Prague. Outlook: Big, smooth guard with tremendous ball-handling skills and creativity. Outstanding talent and clear-cut NBA prospect. If he can improve his jump-shot, the sky is the limit. Currently at the Australian Institute of Sport. Reportedly leaning towards college (2014 recruit), like his father, Cecil Exum, who won a national championship at North Carolina, and moved to Australia to play professionally. Good enough to play virtually anywhere, but likely best suited going somewhere where he'll be counted on as a primary ball-handler, despite his size.